Alex Jones and Tim Rhys-Evans present highlights of the 2015 Proms in the Park. Featuring performances from soprano Rebecca Evans and Luke McCall. 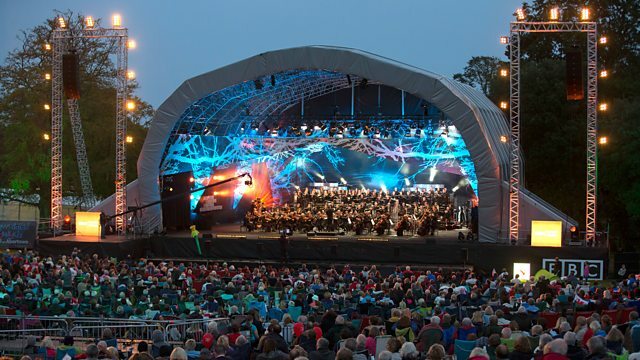 Alex Jones and Tim Rhys-Evans present highlights from Proms in the Park 2015 as Welsh stars, soprano Rebecca Evans and 2014 Welsh Musical Theatre Young Singer of the Year, Luke McCall, take to the stage in Swansea's Singleton Park for a magical Last Night of the Proms celebration. They are also joined by BBC Young Musician 2014 Jazz winner, saxophonist Alexander Bone, performing some specially arranged music. Orchestra: BBC National Orchestra of Wales. Performer: Rebecca Evans. Conductor: Gareth Jones. Orchestra: BBC National Orchestra of Wales. Performer: Alexander Bone. Conductor: Gareth Jones. Composer: Anthony Newley. Orchestra: BBC National Orchestra of Wales. Performer: Luke McCall. Conductor: Gareth Jones. Orchestra: BBC National Orchestra of Wales. Conductor: Gareth Jones. Music Arranger: Henry Wood. Orchestra: BBC National Orchestra of Wales. Performer: Alexander Bone. Conductor: Gareth Jones. Orchestra: BBC National Orchestra of Wales. Performer: Rebecca Evans. Conductor: Gareth Jones. Performer: Luke McCall. Music Arranger: Howard Jeffrey. Choir: BBC National Chorus of Wales. Orchestra: BBC National Orchestra of Wales. Performer: Rebecca Evans. Conductor: Gareth Jones. Performer: Luke McCall. Choir: BBC National Chorus of Wales.